I love telling people this story, mostly so I can say the following sentence. This is the only yidaki I ever bought because I didn’t like it. 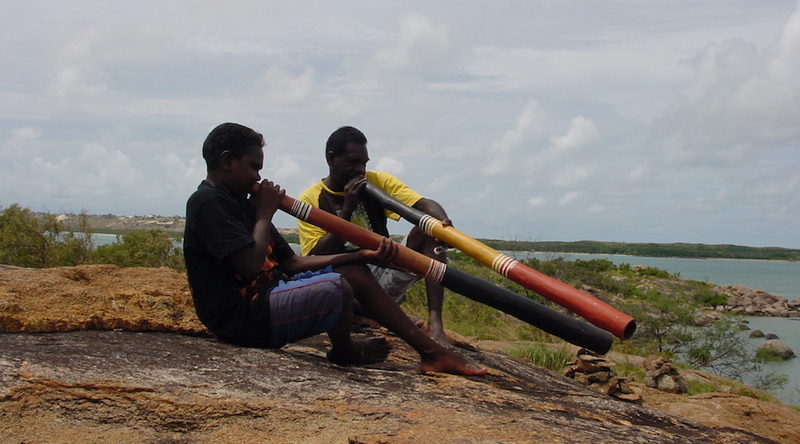 Early in 2004, Milkay and I scheduled our first meeting to work on the Hard Tongue Didgeridoo CD. He recently sold a batch of yidaki to us at Buku-Ḻarrŋgay Mulka. When he met me there, I showed him my favorite of the bunch and suggested that he use it to teach me. He played it very briefly then dismissed it. He chose another one. 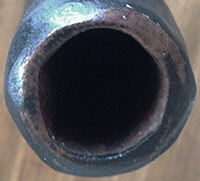 One that I could barely even play, due to its tight mouthpiece and very high back pressure for a lower-pitched yidaki. Milkay declared that it had “good balance.” I didn’t understand. After that first lesson, it went back into the available stock at Buku-Ḻarrŋgay. I decided I better practice on it until it sold, to try and figure out why it was good to him but practically unplayable for me. My lip control improved over a few weeks of picking it up and playing for just a minute at a time here and there throughout my work day. After about a month, nobody bought it from Buku’s website, so I decided I simply had to buy it for myself. I still have it and love it, although I admit it’s still not the easiest for me to play. 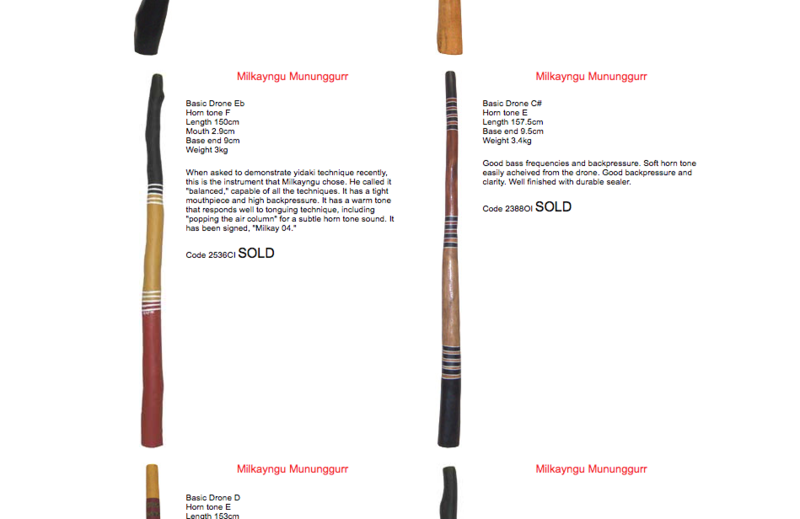 A screenshot from the old yirrkala.com archive. See, any of you could have bought this one back in 2004. We went on to use it for the trumpet exercises and cover images of the CD. So I trust all of you have seen and heard this one already. Here’s the maker playing it. 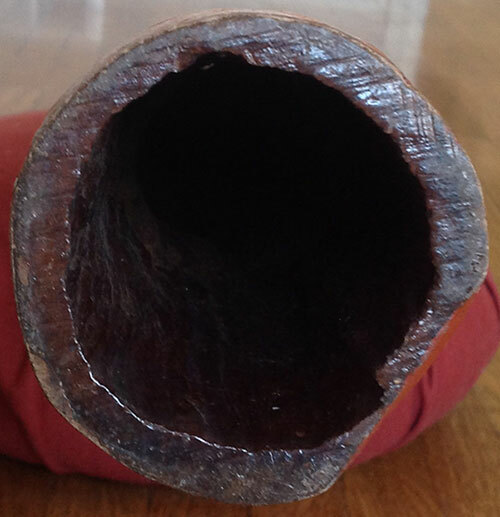 Interestingly, Djalu’ commented that this yidaki has the same deep and powerful sound as his own, but that he didn’t like the higher back pressure. He spotted it right away as the sound of an older man, but the playing qualities that younger Yolŋu go for. Here’s another one of those younger Yolŋu players, the late Mirrwatŋa Munyarryun. He and a few of his family at Dhalinybuy all agreed this was a good “bass yidaki” suitable for ceremonial use. Lastly, here’s when I played it as part of my “Didjeridu of the Day” series on Instagram. Milkay & his son Buyu play this and Yiḏaki of the Month #2 at Dhanaya in 2005. Love your comments and videos, Rendin!